When I first pondered the idea of writing a blog about friends I had every intention to write about Nate and all of his friends. Nate reminded me so much of his daddy when it came to his social butterfly, Mr. Cool, personality. He knew everyone and was everyone’s best friend! But as I started writing this post I was having trouble emotionally finishing it. Every time I think of Nate’s cousins and best friends my heart just aches that children are experiencing the pain of losing him. To see pain in a child’s eyes just breaks my heart. But as the days and weeks have passed I realized this post shouldn’t just be about Nate’s friends. It should also be about these absolutely amazing friends that have stepped up to the plate to support me, cry with me, carry some of my pain, make me laugh, and walk with me step by step. Because after all, most of Nate’s best friends… are also families that are our best friends too. Seth was Nate’s best buddy. These two boys were so much alike. I don’t think a day passed in 2 years that Nate didn’t play with Seth or at least ask to play with Seth. Seth lives across the street and Nate knew when his moms car was in the driveway it meant Seth was there to play. He’d start asking at 7:00 am as he popped out of bed if he could play with Seth that day. We would joke and say they needed their “fix”. Nate and Seth would go through withdraw if they didn’t have a play date at least every other day. These two were trouble together. They were both strong headed daredevils and both tested their boundaries. I often remember them getting into mischief in Seth’s dads garage and getting tools out to “fix” things and then they would leave the tools around the yard and swear they hadn’t been into them. I can see so clearly the look on their faces and that grin in their eye as they would swear they hadn’t touched them. I remember them here building forts of dirt and rocks in the middle of the yard even though they’d be told 100 times not to dig rocks out from the retaining wall. Or destroying the playroom building roads for matchbox cars. Then they would clean up and I would later find every toy tucked into one corner… after all they had to clean quickly so they could move onto the next adventure. It was Seth and Nate. It’s what they did. They were double trouble. It may have driven me nuts then but now it makes me smile at the memory. I actually chuckle as I write it. The boys would often end up in arguments because neither would give in on a decision. Most days they would play really well and end their play dates walking home saying “best friends forever”. At the time I would hear this and giggle and think, okay boys, in a few years you’ll be embarrassed to hear that you shouted best friends forever across the street to your buddy. But now I see that they will be best friends forever through Christ. I will admit, at first seeing Seth after Nate’s death was hard for me. I would see Seth and think of Nate. I would get so upset to see his hurt. Every ounce of me wanted to take that hurt for him. About a week after the service I invited Seth and his siblings over to play and while they were here Seth wandered like a lost puppy. He never wandered in this house. After all it was like his 2nd home. He was 100% comfortable here and knew where every toy was. Then it dawned on me… he was looking for Nate or he was just trying to find his place here without his best friend. So with a tear in my eye, I asked Seth if he would like to pick a favorite matchbox truck of Nate’s to keep in his room. His face lit up and he immediately walked to the upstairs toy bin and told me the truck he was looking for and that he knew it was in there. I thought to myself he’s not going to find that truck in that bin and told him it was probably downstairs with all the other matchbox cars. He said “No, it was here last time we played together”. Sure enough in a matter of 30 seconds he’d found the truck. The truck just happened to be a Steelers themed truck that Nate’s Pappy had given him. Seth’s family are Redskins fans so his choice in the Steeler truck was a surprise. So the truck left me with a smile thinking of Nate in his Steeler jersey running over to Seth’s to play. I think Seth was proud to take that truck home and the smile in his face made me feel better too. A very interesting thing has happened the last few weeks… I’ve watched Seth and Drew create a bond. I think even as they don’t realize it that they feel a little bit of Nate in each other. Seth was sporting his Go Out Be Bracelet in honor of Nate. Honestly, Nate had more friends than I can name because he was always a friend to all. But when I think of another special friend… actually a set come to mind that were from preschool. Emily and Natalie were Nate’s two girlfriends and as much of a “boy” as Nate was he would stroll right with Emily and Natalie without a care in the world. I will honestly say he loved those girls. He really had a care in his heart for them. Natalie has the cutest dimples and a spark in her smile that will surely drive the boys wild! Nate adored her and Emily. Nate started having playdates after preschool at Emily’s house. The big boy playdates were Mommy doesn’t go. Nate was always so proud to say “I’m going to Emily’s afterschool today”. I found out after Nate’s passing that Nate had told Emily about riding his bike. He told her “You just have to pedal really fast and you won’t fall”. 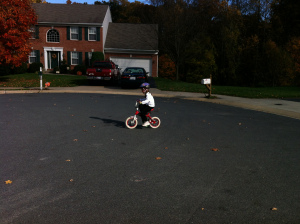 While, it is slightly more complicated than that… That Miss Emily is now riding her bike. She did it for Nate. Nate adored these girls and I think he would have taken care of them through the years. Maybe he will always be taking care of them now. Miss Emily riding her bike! I know Nate is SO proud! I could start rambling stories about Nate and his friends for hours as my mind starts flooding with memories there is another story that crosses my mind of Nate daring a girl to show him her “buttons” and she didn’t just show her “belly” button. He was a wild one and we knew we had our hands full with him. 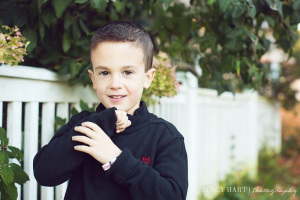 We truly loved his caring heart and his spunky personality! As I have processed the last months I have had many ups and downs. While I’ve had friends that are supportive but I believe aren’t sure how to help me… I’ve also had friends that truly stepped up to the plate and for that I am so grateful. I’m not sure where Justin and I would be without the friends that we have created in this wonderful community. We knew we would have our parents and our siblings by our side. Family was a given. But friends… We are blessed. I believe God placed certain people in our lives for a reason. He knew we would need strong friends. My hope will continue to be in Him. We may not have know how much we would rely on friends but God did. He placed them in our world for a reason. I have these friends that showed up the day of the accident to take care of us. I have these friends that were waiting for us to pull in the driveway the day we came home and they sat in the grass and cried with me. I have these friends that hurt with me and for me and I know they carry a fraction of my pain for me. I have these friends that know we don’t “ask” for help so instead they figure out what we need and get it without being asked. I have friends that I have grown immensely close to these last few months. I have friends that our bonds have forever strengthened. I have these friends that remind me of bible verses and keep me focused and content in my faith. I have these friends that will sit and chat with me until 2 in the morning when I’m having a hard night. I have these friends that know just how to make me laugh. I have these friends that worked so hard on fundraisers and sacrificed their own personal time for my family and for Nate. I have these friends that have reminded me that I have great friends because I am also a good friend. So as the “Day of Thanks” approaches I think of all the things that I could scream I’m unthankful for or angry for. I mean how could I possibly find anything to be thankful for in the midst of what I believe is the deepest grief one can bare? But I am always reminded of my desire to be Great for Nate and to be true to my faith and to continue to hope. So, one of the many things I am thankful for is FRIENDS. For the friends that were so true to Nate. That showed him such joy and fun in his 5 and half years. Friends that helped him become the fun boy he was. And I’m thankful for friends that will walk this deepest journey with me step by step and day by day and they won’t leave my side even on my darkest days. I love you all! I have to admit when we decided to raise money for the Mechanicsville Elementary School playground in Nate’s honor… we never imagined in our wildest dreams that we would be funding not just the 1st through 5th playground but also the Kindergarten playground. We also never imagined that we would be nearing fundraising totals before the end of the year. This fundraising has brought family, friends, and community together. It has restored our faith in the giving nature of human kind and we have been overwhelmed by generosity! Thank you to all those who have donated online via the paypal account on our website, all those who sent donations directly to MES PTA on Nate’s behalf, and to all those who came and supported us at the recent fundraisers! And more importantly thank you to the fundraiser hosts and organizers who deserve a round of applause because you are all amazing and showed LOVE and GREATness in every penny raised! We have now raised over $76,000 on Nate’s behalf from online donations, direct donations, Sykesville Bake Sale, Stacy Hart Photography mini session fundraiser, DoNate Be Great Clothing Swap, VA Family Fun Day, Nathan Chris Baker Fun Day at Hopppers, and other various fundraisers! We are working with MES and the PTA to finalize the totals needed for the playground and we will still continue to fundraise and make donations for the playground to reach our final totals (that should be finalized soon). We will keep you all posted as we reach new goals!!! We are in high hopes of winning Rally for Recess (hint hint see the link under the upcoming event tab for how YOU can help) and that could be a $30,000 addition to the schools totals!!! 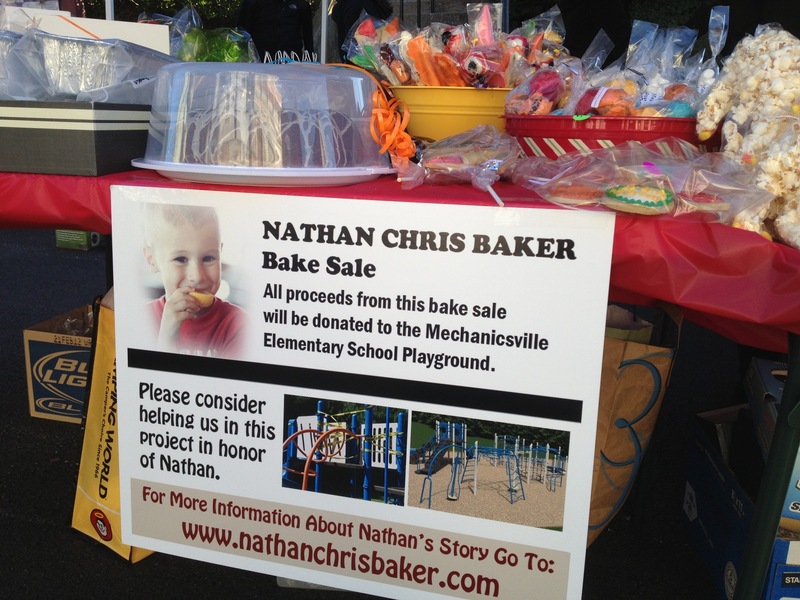 We want to remind everyone that we are still accepting donations online via our website www.nathanchrisbaker.com and while our goal is still to assist funding the Mechanicsville Elementary Playground with the playground of their dreams we are also in the process of creating the Nathan Chris Baker Foundation. The mission of the foundation will be to provide financial, physical, and emotional support to individuals, families, and communities in need. This support will focus on academic and athletic opportunities that promote and develop the strength, confidence, and abilities they need to Go Out and Be Great. Please continue to support us and Be Great. Keep checking back for future events and blog posts. We can not wait to see this playground under construction and then see the kids playing!!! This story came home with Drew the other day from school. He wrote it while in his 2nd grade class. My story of the day that Nate died parallels Drew’s and the ending is not much different. Let me explain. The summer of 2012 began great. We were excited for Drew to be out of school so that we could enjoy a family summer before Nate began kindergarten and our lives were again busy. We had planned two trips over the summer. Each trip was designed to spend time with family and relax from the hustle and bustle that we normally live. In early July 2012 we traveled to Katie’s parent’s home at Smith Mountain Lake where we spent time with her parents, siblings, and our nieces and nephew. The kids enjoyed time boating, swimming, and spending time growing closer. Drew was initially hesitant to be jumping off the dock into the lake but his bravery was on display and he quickly found that he was not afraid. He wore his goggles and life vest and was proud that he had overcome his fear. He must have jumped off that dock a million times. Nate was less sure about jumping off the dock. He would eventually agree to do so – only with the support of his life vest, goggles, and Katie or I catching him as he jumped into the water. He just couldn’t bring himself to jump off that dock alone. Kaylee enjoyed the water and wanted to be out on the boat and in the water as much as possible. It was a great trip for all of us and we felt fortunate that everyone on Katie’s side of the family was able to join us during the weeklong trip. Nate was always fearless and wanted to conquer anything in his path. It was not long after we returned from our trip to the lake that Nate began to talk about his own disappointment that he had not jumped off of the dock by himself. Katie talked with him about this and we both encouraged him to face his fear on our next trip to the lake. Later in July we were fortunate to be able to spend time with my family while camping in Virginia. Everyone in my family found time to come together for this weeklong trip and we enjoyed time at the pool, late night camp fires and the kids were able to make countless memories with one another. There was a large slide at the pool located at the campground that we stayed at and almost all of the kids were able to go down the slide. Drew was all for the slide and after a slight hesitation was up and down that slide more times than we could count. Nate was more unsure of the slide and hesitant to go down. 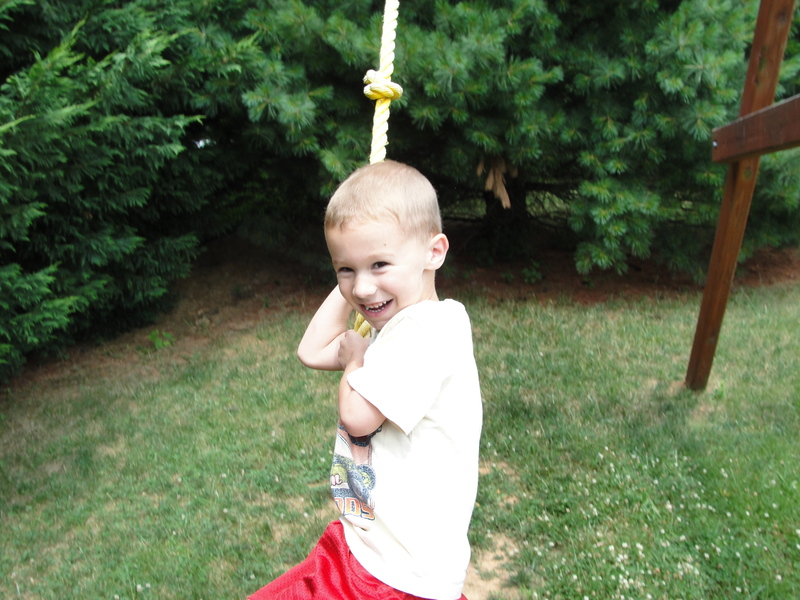 After some coaxing, Nate built up the courage and decided to go down – one caveat……..”Catch me Dad. Don’t let my head go under water.” It was important to him as kids were not allowed to wear life vests on the slide. Nate was used to wearing his life vest when he was in the water and not being able to wear it on the slide made it a more difficult decision for him. I was happy to be able to stand at the bottom of that slide 1,000 times and catch Nate each time he came down. He was so proud of himself for going down that slide. He loved it! The week of camping was great and we felt fortunate to be able to spend time with my entire family and build memories that we will not forget. The summer of 2012 came to a close as quickly as it began and it was soon late August. Nate began the new adventure of kindergarten and as usual – he conquered this with the same bravery as he did everything. At the beginning of August, Katie and I thought that another getaway was needed for the family. My work had been hectic and we both agreed that we needed to decompress and relax for a few days. Katie and I began discussing one last trip out of town to wrap up a great summer. We decided that we would travel back to Smith Mountain Lake to Katie’s parent’s house so that the kids could enjoy one last getaway. Boating, jetskiing, fishing, and swimming were high on our priority list. We decided to surprise the kids with the trip to the lake. When the boys got off of the bus on the Thursday before Labor Day we had the car packed. We told them to get into the car that we were going on a trip. Nate walked to the rear of the car and noticed the fishing poles that my mother bought the boys over the summer were in the back. Nate climbed into his booster seat and said “We are going to Nanny and Papa’s house.” I asked him why he thought that and he said “I saw the fishing poles in the back.” He was right but I didn’t let on. We climbed into the car and began the drive to Smith Mountain Lake. During the trip we prodded the boys on where they thought we were going. Drew read the road signs and they asked questions but we still would not let on. As we headed down Route 81 in Virginia, we began to give the boys hints on our destination. I told them that if they were good – they may get to go motor boating. The boys then sang the country song “Motor Boating” but still had no clue where we were headed. We had not told Katie’s parents that we were coming down and it was getting late in the evening. We decided that we may want to call to let them in on our secret. The boys called down and talked with Chris and Connie and gave them the clues to our destination. Chris and Connie kept the secret and we were well on our way to a long weekend at the lake. The boys were excited to arrive at our secret destination but Nate would fall asleep just minutes prior to our arrival. The weekend began well. 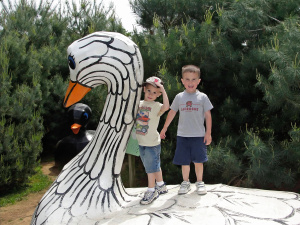 The kids were having a great time and were joined on Saturday by their cousin Hannah. They enjoyed rides on the jetski, boating, and swimming. Drew took right to the water and he and Hannah wasted no time getting back into the routine of jumping into the water from the dock. Nate was still weary and hesitant. Even with his life vest – he didn’t have the courage to jump off of the dock. I coaxed him on Saturday to face his fear and jump off the dock. He eventually agreed but placed prerequisites on doing so. As was the rule, he had to wear his life vest. He had to have his goggles on and he insisted “Dad – catch me. Don’t let my head go under water.” I agreed and got into the water. Before each jump, Nate would walk to the edge of the dock and ensure that I knew the rule, “Dad – don’t let my head go under water.” I caught him each time. With each jump I would allow him more freedom to go into the water just a bit more than the time before. After a few jumps he was confident and began jumping in by himself. He was so proud of himself. I remember the look on his face when he excited the water – it was joy and pride. Nate had conquered his fear. Drew, Nate, and Hannah would jump of that dock hundreds of time that Saturday and they thoroughly enjoyed their time together. Sunday, September 2, 2012, the morning was a bit overcast and Katie was headed out to do some shopping with her mother and sister. Katie took Kaylee with her and I agreed that I would keep the boys at home and watch after Hannah while they were gone. I was comfortable with the boys – I had watched them a million times and they listen well. They know the rules and are well behaved. Kaylee would be with Katie as she had a tendency to be out of sorts without Katie around and had not yet become the daddy’s girl that everyone promises me she will. My father-in-law Chris was home with me and we decided that the overcast skies provided a good opportunity to take the kids out on the lake fishing. We headed out on the boat and fished for a short while before the kids became bored. The kids decided that they wanted to take the boat further out on the lake for a short ride and then back to the house to swim. The weather was starting to clear and Chris and I agreed that this was a good plan. After a short boat ride we headed back to the dock. The kids got off of the boat with their life vests on, put on their goggles, and headed into the water. Life vests were the rule and the kids knew this and followed it well. Chris and I remained on the dock while the kids jumped off the dock and swam. Chris and I fooled around on the dock as the kids continued swimming. At some point I looked into the water and realized that I didn’t see Nate. I walked to the edge of the dock to look in the water close to the dock and check the ladder. I immediately saw Drew and Hannah but Nate was not in sight. I then saw his life vest and water shoes sitting on the dock and thought that he must have gone to the house. My thought was that he needed to use the restroom or was hungry. He had done this before when he headed up to the house. I had reprimanded him before for not telling anyone that he was going to the house. I walked to the house and up the stairs from the basement and into the kitchen. I immediately looked in the kitchen and across the house and could see into the bathroom. Nate was nowhere to be found. That was the point that I knew something was wrong. I knew that Nate would be in one of these two places if he were in the house. I headed back outside and yelled at Chris. “Chris – have you seen Nate?” Chris was still on the dock and advised that he had just seen Nate near the loading dock next to the dock. I could feel the panic begin to set in but told myself to remain calm. I began yelling for Nate and searching all around the house. I told Chris to call 911 and I was joined in my search by some neighbors and boaters who were outside and could hear me yelling Nate’s name. The police arrived a short time later and one of the officers tried to calm me. I remember him saying “He probably just wandered off.” As respectful as I could respond – I told him that he did not know Nate. I know Nate and I know that he would not just wander off. Nate was adventurous but was not the type of kid to go off on his own without telling me where he was headed. I remember calling Katie on the phone and telling her that I could not find Nate. Not a call that I ever thought I would make. How do you lose your son? Moreover – how do you allow something to happen to your son? I remember that as they searched for Nate I felt as helpless as I had ever felt in my life. In so many situations I had been able to help. At this very moment when my family needed me to be able to do something, to fix it………..I was helpless. Nate was gone. Our lives changed. My heart was broken. Not sure how else to explain it. Drew’s story summed it up pretty well “I don’t know the rest.” That version sounds much like mine. I think that is one of the hard parts. None of us know what happened to Nate. I try not to speculate about what occurred – the “How did it happen?” “Well maybe this happened.” I think that those things will only make me crazy and not really answer the question. I think the hardest part is knowing that I was responsible for Nate that day. He was in my care and custody and on that day – I failed him. It hurts to think that he was probably looking for his dad to jump in that water and save him and I did not know he had gone in. I have had conversations over the last month or so and many people have said “You can’t blame yourself. Accidents happen.” I work in a profession that doesn’t believe in accidents. An accident would indicate that the event was not preventable. When two cars collide – it is not an accident. It is a collision. It is preventable. Nate’s death was preventable. I don’t know that I blame anyone – myself included. I do feel some sort of responsibility. These are the facts and that feeling of responsibility will not change. It is something that I carry with me and will until the day I see Nate again. I recall a conversation I had with the boys over the summer while riding in the car. The boys began talking about God and discussing the fact that God created everything. Nate was insistent that God created everything – EVERYTHING. I drove the car as they talked in the back seat and the conversation turned to dying. I remember thinking that the conversation was getting deep and I chimed in “Boys – I will never let anything happen to you.” I said it twice for emphasis. That’s a tough thing to promise and not deliver on. As much as I love my kids and I felt that nothing of this magnitude would ever befall my family – it did. As much as I thought I could protect them in this world – I can but only to an extent. I am not perfect but I know that I am a good father. I know that my kids know that I love them and would never – within my control, allow something to happen to them. Katie and I talked the other day about our love for Nate. We agreed that Nate knew without a doubt that we loved him. We told him daily, we showed him daily and we will continue to share that love with Drew, Kaylee and anyone else who cares to learn about Nate and his GREATNESS. I can’t tell you how many times I’ve heard theese questions. How do you face each day? How have you not lost it? Why haven’t you fallen apart? Honestly, most days I ask myself how I do it as well. But I think the biggest reason I do it is because I am still a MOM. My job is to be a loving mother first. It was my God given role in life. I have 3 children who all need me to keep putting one foot in front of the other. They come before all else. I have a brilliant 7 year old that needs me to show him love. Drew wakes up every morning eager to start the day. He needs me to show him strength. He needs his mommy and daddy there for him to get him ready for school, take him to play baseball, and teach him how to grow into a stunning young man. I have a beautiful 21 month old daughter who is not yet independent enough to take care of herself. She’s ready to greet the world every morning but needs our help to make her breakfast, change her diaper, and tame that hair in order to start her day! Kaylee needs her mommy and daddy to teach her about life. She needs us to hug her, hold her, and teach her to love. And because they both need us to one day find joy and teach them the joy that Nate had too. I have a husband that I love dearly. He is my very best friend. We will do this together as a family. I have Nate. And I will always have Nate. I want to live like Nate did. A life full of love and each day full of life. We will take one day at a time and each day we will wake up and make a choice to be bitter or to be better. Each day we wake up we choose to be better. We will be better for Nate. We will teach and show GREATness for Nate. Do I have answers? No. Do I miss Nate beyond words? Yes. Do I trust in hope? Yes. Do I trust in my faith? Yes. Do I long for the day I can hold Nate again? Absolutely, in fact, I wait for that day. I wait for the day that Nate greets me in heaven and we go running into the arms of Jesus together. We have sad days but we hold to the hope of our faith that Nate is with Jesus dancing and smiling in heaven. I long for the day we all go home with the Lord so we feel no pain or sorrow and I can have my baby again. But until that day my life on earth has a purpose. I may not fully understand it and may never comprehend Nates death this side of heaven but I know we have a purpose. I know that there may be more purpose to my life than I can see right now. But in this moment my purpose involves 2 children and a husband that need me. just over $4,000 from the bake sale, Stacy Hart Photography, and the McDonalds fundraiser. I’m jumping with excitement for a giving community that has restored my faith in giving hearts. I’m feeling blessed with family and friends that have sacrificed so much to support us and help us. But there is still a piece of me missing. I’ve struggled with what most may view as little things in their daily life but to me they have been big things. Sorting laundry, stripping bed linens, prepping the shoe bin for winter and cleaning out the summer shoes. I walk into the playroom and its oddly clean and for a moment I feel relief because there’s a clean room then I realize it was Nate’s mess we were always stepping over. I look in the pantry at uneaten cereal boxes and realize they were Nate’s favorites. So when I’m asked if there is pain. Yes, there is. But each day I will continue to be better and to be Great. I will continue to seek God and I know he will continue to give us the strength we need to move forward. 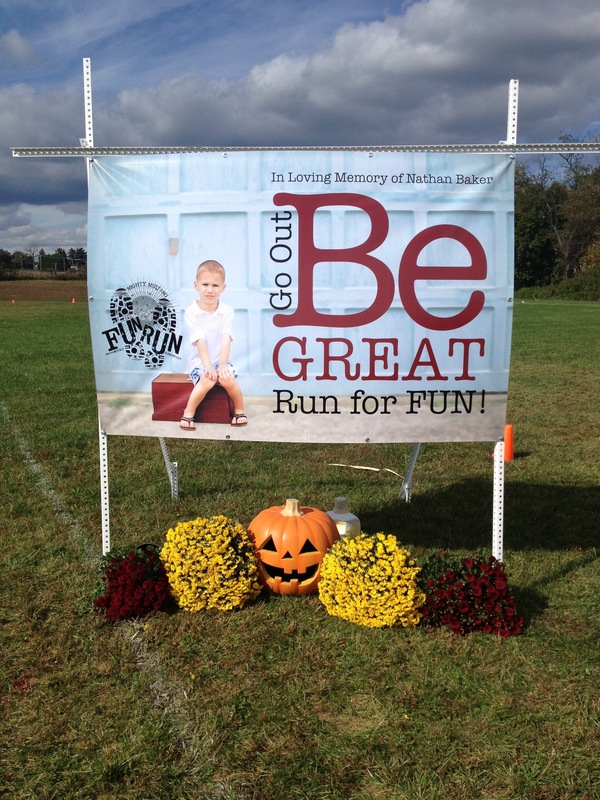 The schools fun run fundraiser was a success and they had a banner made Go Out Be Great! Love it. Bake Sale was a huge success!!! Thanks for everyone who donated baked goods and volunteered. We couldn’t have done it without you! 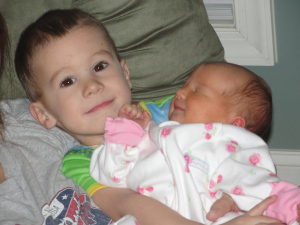 In 2005, Katie and I were so excited to welcome our first son into the world. I remember being nervous about bringing a child into a world that was so imperfect. I assume that other parents feel the same but I was nervous for all of the things that I didn’t know. I was nervous about having a baby and about all of the things that could go wrong. I worried about the big things – will he be healthy, will he have 10 fingers and 10 toes, will he be “normal” (whatever that is), will I be a good parent. I worried about the little things – will I be able to change a diaper, will I be able to afford the things that every parent wants to be able to provide, will he be “cool” (whatever that is). Katie’s pregnancy was rather normal and we found out that we would be having a boy. I was so excited to be having a boy. A boy! A wrestler! A Baker boy! Katie was the prefect mother-to-be and although I doubted my skills, abilities, and readiness to parent a child, I never questioned her readiness for the challenge. I knew she would be a great mother from the time we found out she was pregnant. I was the son of a union coalminer and grandson of a union steelworker. I have always been proud of that and I knew that having a son would allow the Baker name to carry on through me. No matter what happened in life – no one could take away my family name or the hard work that made us who we are. I knew that naming my son was one of the most important decisions that I had and would define who he was. I wanted his name to honor my family and define his character. Katie and I decided on Andrew Jason – Andrew after my father and Jason after my brother. I couldn’t think of two other people who defined what the Baker name meant to me – hard work, loyalty, and integrity. Andrew means – manly, brave, warrior. Little did we know at the time that he would need all of these qualities at such a young age. Shortly after Andrew was born we knew something was not quite right. The doctors noticed that his breathing was labored and they decided to take him to the NICU. We were in a hospital with a level 3 NICU and were confident that he would be ok. For the next several days they worked on Drew and his breathing. He would seem to get better and then have a setback. I remember how deflated we felt – we had a son who we were not able to hold or feed. Someone else had to provide the basic needs that we were supposed to be providing. I remember how scared we were and hopeful that we would be able to bring him home soon. At the time, it was the most unimaginable thing for two young parents. The feeling of having to leave the hospital without your child – your first born child was not one we ever prepared to experience. I remember Katie and me leaving the hospital and driving home without Drew. We were just praying that he would get well quickly and we could bring him home. Shortly after coming home, the phone rang and I answered it. I remember the female on the other end saying she was a doctor at the hospital. She went on to say “Drew crashed. We are bagging him and he is going to be transported to Johns Hopkins. You need to come to the hospital immediately.” I have been around paramedics and doctors long enough to know that “We are bagging him” is not good. I don’t remember telling Katie what the doctor said – I just remember telling her to get into the car. We got to the NICU and sure enough – they were bagging him, by hand. Forty five minutes later a transport crew from Johns Hopkins arrived to transport him. The doctor introduced himself – Dr. Quack. Seriously…….Dr. Quack? Of all the people on the earth – you send me Dr. Quack! Drew was diagnosed with PPHN. Basically the blood vessels in his lungs would not expand and therefore were not getting enough oxygen. He spent almost a week at JHU in the NICU and I remember thinking about how lucky we were to live near this world renowned hospital with great doctors like Dr. Quack. They took good care of Drew and he gradually got better. I recall looking around at the other children in the NICU and thinking how lucky we were. Here we were – our son hooked up to every type of machine known to man and I knew that he was in better shape than most of the kids in that unit. True to his name, Drew was a fighter. After a week at JHU he would be transferred back to the local hospital and then released a few days later. After we were home for a few days Katie came down the stairs and was holding an empty bottle. She said “Look at this.” I looked and thought nothing of the empty bottle. She again said “Look at it!” She was clearly agitated. I looked closer and noticed that the label said Baby Boy ????? – Not Baby Boy Baker. I said “Did you feed that to him?” Yep, we fed our son some other lady’s breast milk. A call to the charge nurse revealed that “Mr. Baker – This happens more than you would think.” Wrong answer! I spoke with Risk Management and our pediatrician was granted access to this very nice ladies medical records. Everything was fine. To this day – he is healthy as can be. 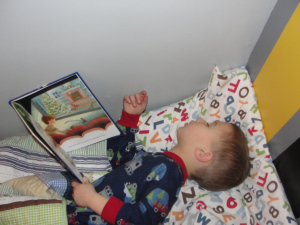 Drew began reading when he was 3 and everyone has always been amazed at his memorization and ability to learn. He likes school, loves math and science, is a tech kid and knows more about my iPhone than I do. All I can say is this – he didn’t get it from Katie or me. Had I known that some strange lady’s breast milk was that good – I would have stocked up. 19 months after Drew was born, we were blessed to be having another son. Again I was excited but hesitant after going through the complications Drew had. Katie and I again took the choice of naming our son very seriously. Katie’s father Chris is a worker – a self-made businessman who never asked for anything and could build anything. Her father has worked hard every day of his life and we wanted to honor him. Nathan Chris was born on December 23. He took the name Chris after her father and brother. I am not sure why we decided on Nathan but I know that Chris – not Christopher was done for a reason. Nathan means – He (God) has given or Gift of God. Nathan was curious and a fast learner. He was walking at 10 months old and was always aiming to keep up with Drew. Although he never had a real interest in the things that Drew had a knack for – reading, math, books, video games, etc. He always looked up to Drew. He knew how smart Drew was and used it to his advantage. The boys always wanted books at bedtime. Drew would read a book each night and Katie or I would read to Nathan. If that wasn’t the case, Nate would look at pictures or climb into bed with Drew and have Drew read to him. Nate excelled at physical activities. This summer I taught them both how to ride a bike without training wheels. Nate was the first to learn – he had more time to practice since he was not in school. He picked it up quick and was off and riding. The day that Nate learned how to ride, Drew got home from school and we practiced riding. Nate was zipping around and almost taunting Drew. Riding close to him and weaving inside and outside of Drew as he tried to learn. Drew was nervous and was getting mad at Nate for getting so close. I yelled at Nathan to “knock it off.” He just laughed and rode on. That was Nate! He was outgoing, confident and cocky at times. He didn’t always know the answer – so he would just make it up. Nate was relaxed and let things roll off his back. He was carefree. Drew is more reserved, exact, and always rights. He strives to make sure things are perfect and takes things personal. He is a perfectionist in everything that he does. We always said that Drew would design or develop whatever it is and Nate would build it. I have always been so interested in how two kids can have the same parents and turn out so different. Both boys are perfect in their own way but so different. Katie and I often talked about this and whether or not we raised them differently. I don’t think we did. I am not sure if it has something to do with birth order or just the fact that they are uniquely different in their own way. I’m not sure but I do know that it is fun. Recently I have spent a lot of time with Drew and Kaylee. 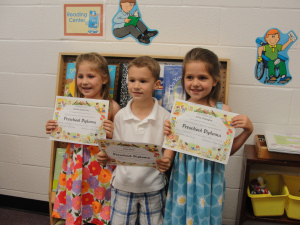 I am extremely proud of both of them and honored to be their father. We talk with Drew nightly about Nathan and recall memories that we all shared together. We will strive to make sure that Drew and Kaylee know everything that we can remember about Nate and the love that he had for them. We try to let them feel the love that we have for all three of them. I can’t describe the love that I have for these three kids. I am not sure that parents are capable of defining the love that they have for their kids. It is overwhelming. It is something that every parent knows but can’t describe. Nathan – He (God) has given or Gift of God. We were blessed with more than 5 years of loving Nate. Watching him grow and live each day so full of life and love was a blessing. Someone once said – It is better to have loved and lost than never to have loved at all. I struggle to buy into this but know that I can’t imagine not knowing Nate’s love. I am proud to be Nathan Chris Baker’s father and honored to have had the opportunity to have shared his life and feel his love. One thing was clear the day Kaylee was born. Nate was finally a big brother. He was proud. He wore the title proudly. 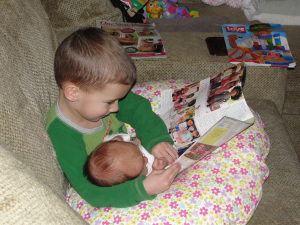 He loved being Drew’s little brother but I think Nate really loved being a big brother. It gave him a sense of control. It gave him the role of being a caretaker. 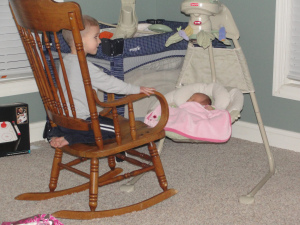 He was always Daddy’s helper, but when Kaylee was born, he took on the role of Mommy’s Helper. Nate always had a soft spot for babies. Maybe because he had a heart full of love or maybe because he knew he was older and felt he had authority… probably both…, but as wild as Nate was he would stop and acknowledge a baby in awe. He was in awe of Kaylee from the day she was born. When I delivered Nate December 23rd, I was insistent on getting home to Drew as quickly as possible. Drew needed his mommy home and I needed my family complete for Christmas. As with Nate’s delivery I chose the same route after having Kaylee. Some mothers like the quiet time in the hospital. I liked the chaos of my house. I came home from hospital 24 hours after having Kaylee as well to be with my boys. I was in love with a beautiful baby girl but my heart was at home with my boys. They were my world. At home is where my family would be complete. Our first night home I spent in my cozy green rocking recliner that so comfortably took me through three pregnancies and months of nightly nursing for 3 babies. Nate ventured downstairs at some wee hour that first night home with Kaylee and he climbed right into that green recliner with Kaylee and I. He snuggled into me then wrapped an arm right over top of Kaylee as if he was caring for her too. He laid there with me for hours that night. He watched Kaylee sleep, and eat, and then eventually fell asleep in the chair with us too. He filled my heart with so much love. You know how there are some moments that can be ingrained in your brain as a picture forever… This was one of those moments. Drew was his best buddy. Daddy was his hero. Mommy was his love. Kaylee was his heart. His love for her was clear from the moment he laid eyes on her. I knew that night he was going to have a heart so big and love that baby girl! Nate just watching Kaylee in awe. A moment captured in time. 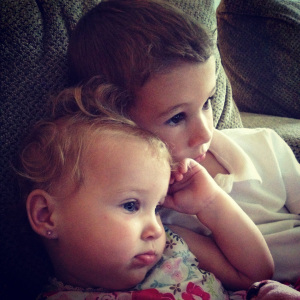 Nate spent countless mornings under a pink cupcake blanket snuggling with his sister, he helped change her diapers, he and Drew tucked her into bed each night, he was always so mindful of her feelings. She often demanded him to do what she wanted. As tough as Nate was…. He wasn’t with Kaylee. He did as she said. She would drag him across a room by his shirt and he listened to her. Those who know Nate will know that he didn’t like being told what to do… But what Kaylee wanted Kaylee got when it came to Nate. He played with her kitchen set proudly. He pushed the pink shopping cart with a smile. 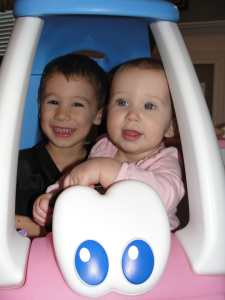 He rode in her pink coupe car without a care in the world. Did he love her toys? Yes, he did. But he loved playing with her with the toys more. As I think of Nate in heaven it brings me comfort to know he will always be her angel. He will always be watching over her. There is a hole in my heart that hurts so bad to think that Kaylee will not remember how much Nate loved her. But I promise you Kaylee that I will make sure I do everything I can to tell you how much your brother loved you. I’m going to make a picture book of the hundreds of pictures I have of him holding you and snuggling with you. I’m going to tell you about how big his heart was under that tough exterior. I’m going to teach you how to love like he did. Your daddy and I will continue to teach you and Drew how to BE GREAT. Anyone who knows Kaylee knows that she is so much like Nate. She reminds us of him daily. She is full of life, loves to be outside, can throw a tantrum that may just beat his, can give a scowl look that burns, but can smile and laugh and light up a room with joy. Kaylee, God gave you to us with a touch of Nate’s soul. Kaylee Grace… you are our Saving Grace. I have found a lot of comfort in music the last few weeks. Some songs make me smile and some songs I can actually feel the love of Christ as if the Lord has wrapped his arms around me to remind me of his love. Some songs, admittedly, make me angry. And many songs make me sad. I’d listened to the song Godspeed by Dixie Chicks years ago but when I heard it again just recently it took on a whole new meaning. Emotionally, it hit me. It hit me hard. I cried… the pour tears kind of cry. This song is my prayer to you Nate and I promise you that every night I WILL fly my love to you on angels wings. I know you know how much we LOVE you sweet pea. The rocket racers all tuckered out, Superman's in pajamas on the couch…. reminds me so much of you. You played hard, you worked hard, you loved hard, and when you fell asleep at night you slept hard too. You were my rocket racer. God Bless Mommy and Matchbox cars, God Bless Dad and thanks for the Stars. Nate was a boy that loved his trucks and cars. He has at least 250 matchbox cars and given the choice he’d use allowance money each week to buy one more. 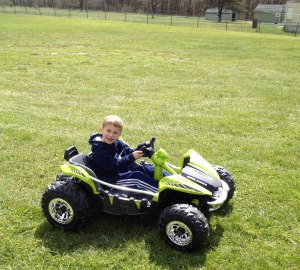 Nate had already decided he was asking Santa this year for a gas powered 4 wheeler. Oh, my sweet Nate, I love you buddy. We will be GREAT for you NATE. The dictionary defines Quiet as follows: making no noise or sound, especially no distrubing sound. Free or comparatively free, from noise. Silent. Restrained in speech, manner. Almost every parents seeks it. At times we beg for it or demand it: “SHHHHHH”. “Be quiet”. “Can you be quiet for one minute?” “Hush.” “Let’s play the quiet game.” “QUIET!” “Shut up!” Any way you say it or have said it, you understand where I am coming from. When you have kids – you long for just a moment of Quiet. Just one single moment of silence so that you can collect your thoughts and get your head right. Just a moment. I admit that my hearing is not great. I have a hard time dealing with background noise. This is especially true when someone is trying to talk to me. Not sure what the cause is, maybe it was the excessive level of the car radio in high school. Maybe it is from the noise at work. I am not real sure why but I have always had a hard time listening to someone talk while there is background noise. This extends to my thinking. I have never been good at concentrating with noise in the background. Nathan was that “noise.” It was a constant with him. He was always busy doing something. That something always required noise. If it weren’t the random noise of him getting into something, it was the sound of his voice. Drew has always been relatively quiet. He is a thinker. He is a rule follower who does everything with precise intention. Never one to break a rule, cause to much commotion or rock the boat. Definitely not one to create much noise. It was totally opposite for Nathan. Since Nate was born our house has always been buzzing with noise. He was a well behaved kid but always one to test the limits and see if the rules really applied to him or if there really were consequences to breaking the rules. I think at times he would break the rules just to see what the consequences were. I remember Katie and I sitting in the room and hearing a noise from the kitchen pantry. We could both tell that someone was digging in the pantry and so we called out “Nathan – what are you doing?” Nathan replied “Nothing.” The rustling continued and we again inquired about what he was doing. He advised that he was getting some goldfish. A few moments later we could hear him digging through the pantry again and we again asked what he was up to. He advised that he was just getting some goldfish. When he walked into the family room we immediately noticed the chocolate smeared on his face. We questioned him about this and he was adament that he had not had any chocolate. We questioned him more and he got defensive and denied eating any Hershey kisses. When we confronted him with the evidence still smeared on his face – he got somewhat angry. It was that “noise” that gave him away. He was never good at admitting that he had been caught. Lately our house is awkwardly quiet and it is not something that we are used to or comfortable with. Kaylee is much like Nathan and provides some noise to relieve that silence that is so evident within the house. It is just not the same. I realize that Nate’s “noise” broke those moments that were filled with silence. It was that “noise” that broke the monotony and made life so exciting. The rustling of Nathan getting into something that he shouldn’t or the arguing between him and Drew. It was the noise that I did not appreciate at the time but have come to miss greatly. I find myself looking for things to break the silence. Some reason not to be still or silent and think about the events that have occurred over the last few weeks. I long for that “noise” that made every day at my house “crazy town.” Kaylee will help with this in the days to come. Anyone that has been around Kaylee knows that she will keep Katie and I busy as she grows. She is a nut and I wouldn’t want it any other way. She reminds me a great deal of Nathan. The next time that you seek that moment of silence – take a minute and listen to that “noise.” Think about how great that “noise” really is. Think about how stir crazy you would be without that “noise” in your life. Think about what that “noise” really represents. It is a “noise” full of life and joy. A “noise” that makes each day challenging and different. It is a “noise” that makes your life what it is. That “noise” is what life is all about. No life has ever been exciting without that “noise”. Take a moment and enjoy that “noise.” Do not supress it or silence it – cherish it! It is the “noise” of your life. In August 2006 while Katie was pregnant with Nathan we decided that our family needed a new home. We knew that our 2 bedroom townhome was just not going to be able to accomodate our growing family. We purchased this home with an acre of land and I was excited about the growth of our family and the size of the yard. We were moving to a place with just over an acre from a place that seemed to be the size of a postage stamp. A place where I would finally have a need for a riding lawn mower and from a place that I could cut the grass with a weed-whacker. We were moving up like George and Weezy. We had finally made it! The day we moved to the new home I went out and purchased the new lawn mower. A brand new Cub Cadet with a 50 inch cut. I was so excited that I failed to buy gas for the new mower. We had to push it to the shed. I was so excited that I failed to measure the opening of the shed. Needless to say – the mower was not going to fit in the shed. My friends who had gathered to help me unload the mower suggested that I just leave it outside until other accomodations could be made. Me being the proud owner of this new machine that proudly displayed Made in the U.S.A. on the back was not going to allow this fine piece of machinery to sit outside. I quickly got the saw and cut two notches in the shed so that the mower deck could fit inside. A bit hillbillish – I admit. I enjoyed my time cutting the grass. I have always enjoyed being able to be alone, to reflect on life, work, etc. and hash out the worries of the world. Just me and myself in my own head. A lot can be fixed in the world by a person on a riding mower. I would plug in the iPhone and turn on the tunes…….all was right in the world. Nathan was born in December 2006 and grew to love that lawn mower. By the time he was able to walk he was ready to ride. He would sit in my lap and just be in awe of everything. I can’t recall how many times that he rode the mower with me but it was many. I remember the times that I would go out and cut the grass without him and seeing him standing at the front door looking out at me. I couldn’t help but drive up to the front and pick him up. 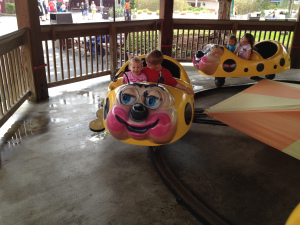 Even it were just for a few passes through the yard – he was happy. I have many, many fond memories of cutting the grass with Nathan on my lap. It had recently reached the point that he was almost to big to sit in my lap so he would stand between my legs and ride. He had become pretty good at steering and paid close attention to where he was driving. He knew that I was particular about how the lawn was cut and he was developing the same OCD tendencies. He loved it! I remember filling the lawn mower with gas once and Nathan telling me “Dad, I love the smell of gas.” I talked with him briefly about how it was not good to smell gas but thinking to myself – I love the smell of gas too. I mean what red-blooded American boy/man doesn’t like the smell of gas? As I filled up the lawn mower today and the smell of gas came from the can – I thought about Nate and how he was all boy. Often we would listen to music on the iPhone as we rode. I would give him one ear-piece and I would have the other. I remember holding him in my lap as we rode and just hugging him and telling him that I loved him. He would always respond “Love you too Dad.” Those rides were times that I will hold tightly and never forget. Today I cut the grass for the first time since Nathan’s death. I plugged in the iPhone and walked to the shed to get the lawn mower out. I struggled through cutting the entire thing. That being alone, just me and myself, in my own head was hard to deal with. I knew that I needed to be out there working through it. I mean you can’t live the rest of your life without cutting the grass. It didn’t make it any easier. A small job around the house turned out to be one of the hardest moments that I have had to deal with since his death. As I rode around the yard I began remembering all of the times that he was sitting on my lap riding that mower. I thought about how small of a task it seemed at the time and how much of an impact that small task with my son had on my life. I am not sure that I will ever enjoy mowing the lawn like I did when Nate was around. I do know that Nathan loved cutting the grass and his OCD about the grass would not allow me to neglect it. He would have insisted that we go out and cut the grass. Each day we are faced with small things that seem so minor during the hustle and bustle of the real world. These small things that often seem like work are in retrospect the very things that we live for. I always knew that I enjoyed cutting the grass but never realized how much I enjoyed it until Nathan became part of that small task. I imagine that without Nate being part of the equation – it would just be another chore that needed done weekly. With Nathan – it was Great. Something we both loved! He made the small things in life – the great things in life! Go Out. Be Great. Take a moment to enjoy the little things in life. Today we received a card and letter from friends. The card and letter filled my eyes with tears but also brought a smile to my face. Thank you, Dan, for sharing your memory of Nate. I’d like to share the letter with you all so you see another little piece of this little boy we loved. I wanted to take a moment to express my deepest sympathy for the two of you. Since the death of Nate I’ve been finding myself welling up at the very moment a thought about that little boy enters in. although words cannot adequately convey it, my heart just breaks for the two of you and for what memories and ties your children had to Nate as well. But while I can’t begin to imagine your anguish, and the myriad of life changes, I just wanted to take a moment and share how Nate impacted my life and household in the very brief time that we knew each other. Sitting in Justin’s office one day I mentioned a plumbing problem and, per usual, he told me not to hire a plumber but that he would come over and take care of the issue. So, on the appointed day, when the knock on our front door signaled his arrival, little did I know that my day was about to be brightened by the presence of a little spitfire named “Nater-Tater.” LOL. I specifically remember beaming at him through the screen door, because while Justin was carrying his 50lb tool bag, clearly, CLEARLY it became obvious that Nate was carrying the more important tool bag – his! And he wanted to make sure that I knew that at our greeting that day! (I’m chuckling now as I relive that memory). And from that moment until the moment the job was complete Nathan did not leave his father’s side. It made a lasting impression on me for several reasons. First, because it was obvious by his wanting to be around his Dad that Nate was being raised in a good home and in a proper way. It was overwhelmingly obvious that he was loved AND that he loved the man (and by extension his mommy) who was raising him. I watched as Justin poured out not only his patience at teaching his son about working and helping others, but underneath that patience I could vividly see the love between a father & son. The second impression that has really struck a strong chord in me was the somewhat funny exchange that Nate & I had that day. And as I’ve thought about this quick exchange over the past week or so, ESPECIALLY after now knowing the type of little guy that he was, it has brought some laughter to me in the midst of the pain I feel over his death. Let me explain this little exchange we had: it occurred while the three of us were in the bathroom working on the plumbing. Justin had asked Nathan to hand him a tool but needed to describe what it looked like because it was inside the tool bag and wasn’t a “normal” tool. I happened to be right next to the tool bag at the time and saw the tool, but in the time that Nate was given the instruction, to the time his little hand entered that bag, HE SHOT ME A LOOK that conveyed, “Hey man, don’t you even THINK about touching that bag. My dad told ME to get that tool, not YOU!” Hahahaha. It really was THAT strong of a look… I’ll be honest: I was a little intimidated at that moment!!! LOL… Seriously, though, as I recalled that moment and had a laugh to myself, I couldn’t help but think how that tiny moment shone a light on a little boy with a HUGE personality. So when Justin was giving the eulogy and spoke of Nate’s “bigness,” my mind couldn’t help but be transported for a moment back into the bathroom that day and the look on that boy’s face = priceless! Savior – who IS our only hope in this broken world, that your days be filled with not only peace & comfort, but the assurance that joy will be yours once more, fully restored. Nate brought me joy on the day we spent together, and I felt truly blessed to have known him. 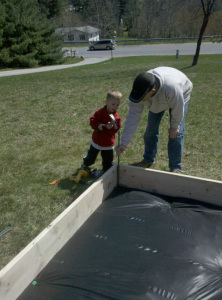 Nate helping Daddy build our garden 2 years ago.